This stunning new offer is an extension to our original and ever popular Beach Penny collection, with a gorgeous base fabric in 100% Mid Weight Linen and a design that falls in a delicate linear way with panels of negative space, restful on the eye. A classic collection for any home. Printed in New Zealand in a selection of monotone colourways. Volterra, is our beautiful new collection of wide width stabilised 100% Linen fabric offering a stunning drape and a semi-sheer natural texture. 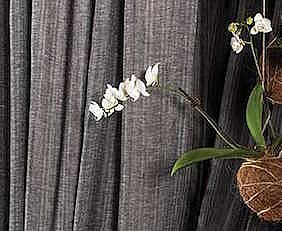 With the use of different yarn shades in the weft and warp an attractive subtle colour reflection is achieved by light. Inspired by nature’s colour palette the tones in this collection move from true white and earthy pastels to gorgeous two-tone warm honey gold and deep moody greeny blue. How fortunate we are to have such talented textile designers right here in New Zealand and Hemptech takes great pride in being able to use their designs to show case our country to the world. Wild Flower is another of these stunning designs this time by Nellie Ryan. We have some simply stunning new colours to add to our already popular Modena range. Modena Series 2 has the same base cloth as the earlier fabrics but the new print finishes of Copper, Iron and Platinum are a world apart from the originals. The colours have been refined and applied with such delicacy they melt into the weave of the fabric and just softly shimmer. As you would imagine from the names the Copper is a soft shade of pink, the Iron a subtle grey and the Platinum shows just a tinge of green. A new 100% natural wide width fabric celebrating nature and the wonderful world we live in. 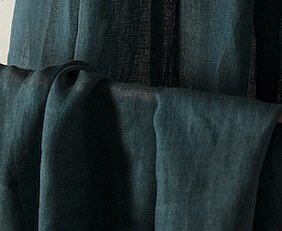 This delicate textured fabric has a classic quality but the soft polished finish just gives it that contemporary edge. The subtle tone of the colour palette moves from soft neutral shades to more intense darker colours, reflecting the landscape around us. The Native NZ bush is a place where I most feel at home. 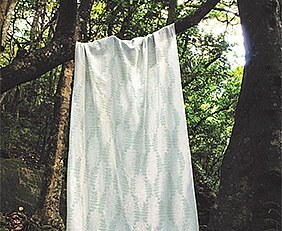 This Fabric design was based on my love for the native climbers. My favourite climbers are the ones that become epiphytes and take over a host tree. I love their unique resilience to reach up and grow out of the dark! 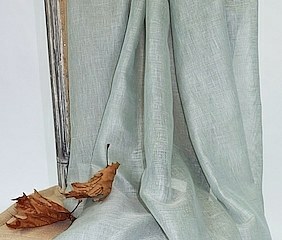 Another beautiful wide width 100% Linen fabric from Europe with a special aero finish. 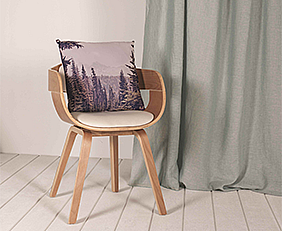 The aero finish stabilises the fabric which will then only allow for minimal movement when used as curtains but at the same time makes it lovely and soft to the touch meaning it will drape just beautifully. The perfect natural fabric. The Tresana also has an interesting texture which has been achieved by using slightly different colours for the warp and the weft. The colours that tone so beautifully together really enhances this almost plain fabric. 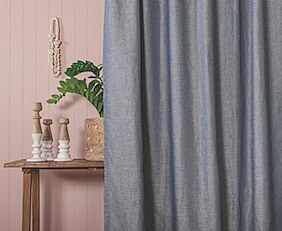 Rossano, a beautiful new wide width drapery fabric with a soft textural appearance enhanced by the variable self-stripe, 100% Linen and stabilised to minimise any movement. The colours range from Whisper an off white, to Mistral a soft warm grey, through to Tempest, which as the name indicates, is almost Black. Rossano is imported from a very top European mill using locally grown linen yarn, this is very important as the quality of the yarn is imperative to the quality of the fabric. Linen plants grown in poorer conditions can be used for yarn that may look good initially but will not stand the test of time. The absolute ultimate in fine linen – Veneto - 100% soft natural linen with a subtle glaze that shows its true beauty in the evening under soft lighting. Veneto is woven from beautiful refined linen yarn that’s then polished to enhance the natural beauty of this exquisite fabric. Veneto is stabilised, meaning it will have minimal movement when hung. The understated colours work well in many different styles of homes from the classical right through to the very modern – soft greys and neutrals and a beautiful soft turquoise. "Simple sophistication" describes the beautiful new Estiva fabric to perfection. Estiva is a traditional 100% linen fabric that is very much part of the movement back to essential values of calmer living and simplicity where quality is absolute paramount. The soft muted colours of this textured fabric fit so well in all modern décor as well as enhancing the more traditional style of home. Our new Flax Pod design is printed on beautiful European warm white soft bleached linen yarns woven to create a mid weight drapery fabric. We all recognise the tall green sword-like leaves of the Flax that can be found growing extensively throughout New Zealand and Australia. The Flax flower not only enhances our landscape it also provides an abundant food source for many birds including Tui’s, Bellbirds and also many different types of insects. 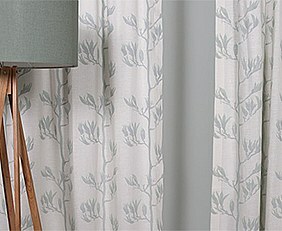 Printed in 3 colourways, shades of turquoise, hints of soft greys and neutral sandstone. This tumble of roses, falling in all directions was inspired by the contrast between soft and beautiful and sharp and geometric, which can be a rose to a T with its soft flowers and its sharp thorny branches. 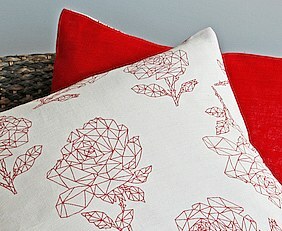 Designer Leanne Culy wanted to create a print that was sharp and modern yet still beautiful and soft. The seven colourways range from gentle muted red and blue to soft dusk tones through to rich amber. Tumbling Roses is printed on a beautiful soft 100% linen fabric and is suited for a wide range of interior settings. Hemisphere is a soft textural upholstery fabric, available in seven beautiful colourways. It’s shot through with timeless muted colours like shades of the past and is literally a fresh take on days gone by. Hemisphere is woven from the finest natural European linen and wool creating a very durable yet soft to the touch fabric. This upholstery range is suited for relaxed seating applications as well as that stunning one off feature chair or formal couch. 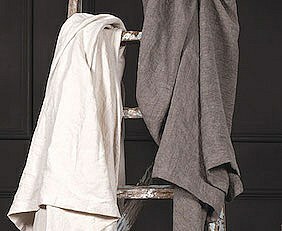 Combining the wool and linen together creates a great eco story and a fabric with a wonderful finish and feel. The absolute ultimate in fine linen – Veneto - 100% soft natural linen with a subtle glaze that shows its true beauty in the evening under soft lighting. Veneto is woven from beautiful refined linen yarn that’s then polished to enhance the natural beauty of this exquisite fabric. Similar in style to our Bella fabrics it has the added advantage of being 295cm wide. Veneto is stabilised, meaning it will have minimal movement when hung. The understated colours work well in many different styles of homes from the classical right through to the very modern – soft greys and neutrals and a beautiful soft turquoise. Monet’s impressionist style paintings have been the inspiration for La Flora. 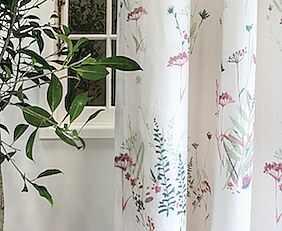 Soft floating flowers in vibrant colours that have a misty transparency highlighted by the luxurious semi-sheer European linen fabric it has been printed on. 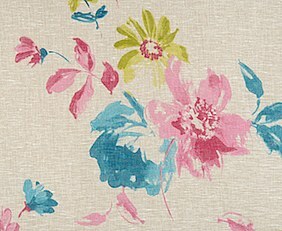 La Flora is a 295cm wide continuous drapery fabric. The collections' colourways range from gentle muted beige browns to the soft tones of a faded summer garden through to rich floral colours. 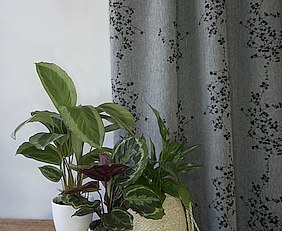 La Flora is a beautiful fabric that drapes naturally and is full of energy and life.